Good Friday 2014 was a winner at my house. Sunny and warm, full of picnic lunching and garden work – yes, a winner, indeed. 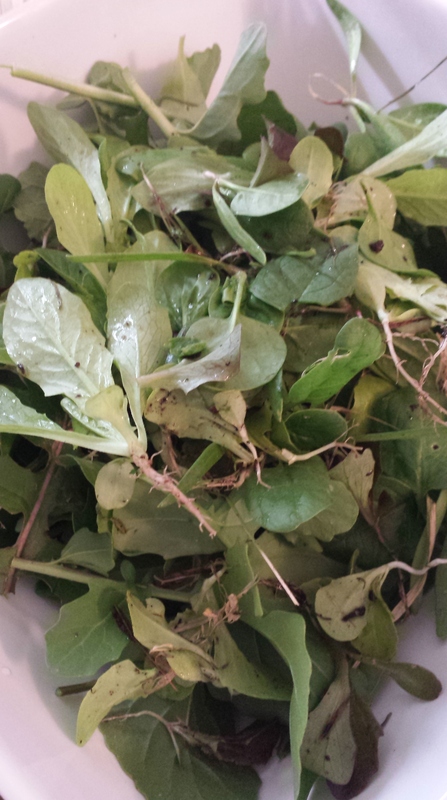 As I was pulling some stray weeds out of the raised beds to prepare them for planting, I realized that quite a few of the “weeds” were actually rogue arugula that must have hung out in the beds over the winter. Combined with the baby greens I thinned out of the lettuce bed, they became part of the evening’s fantastic dinner salad. Inspired by one of the best salads I’ve ever eaten, (the arugula and fig salad at The Girl and the Fig restaurant in Sonoma, California,) this salad combines many of my favorite foods. Lots of recipes shine because most of the ingredients are highlighting the flavor of one superstar ingredient. In this salad, you can’t quite pinpoint the superstar ingredient, and as far as I can tell, it’s because they all stand out. The peppery bite of just-picked arugula, the distinctive creaminess of chevre, the nutty finish of olive oil, the familiar umami of bacon, the pleasant pop of vinegar, and the herbed pecans (they’re just to die for). Somehow, each ingredient is noticeable while managing not to overpower your tastebuds. Subtle it’s not, but I could eat it for days. Start with a mess of greens. 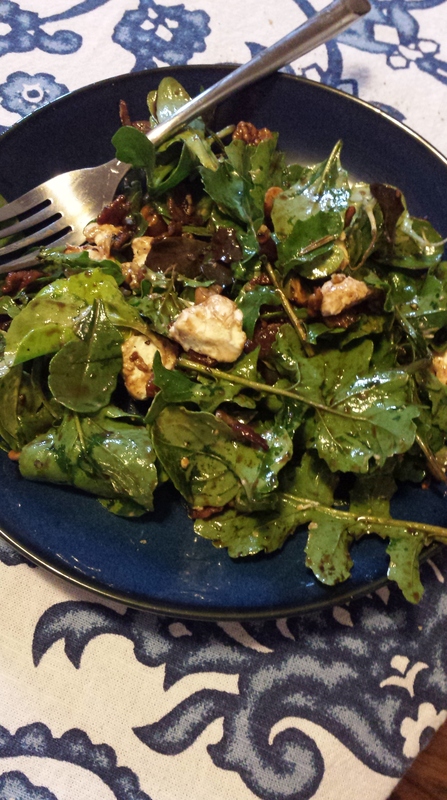 I thinned out tiny butterhead lettuce, romaine, iceberg, and a few miniscule carrot tops and those are what you see on top, but most of the salad was arugula, from those sneaky plants I found in the garden. Soak them a while in a bowl of water. Trust me, you’ll be glad you did. 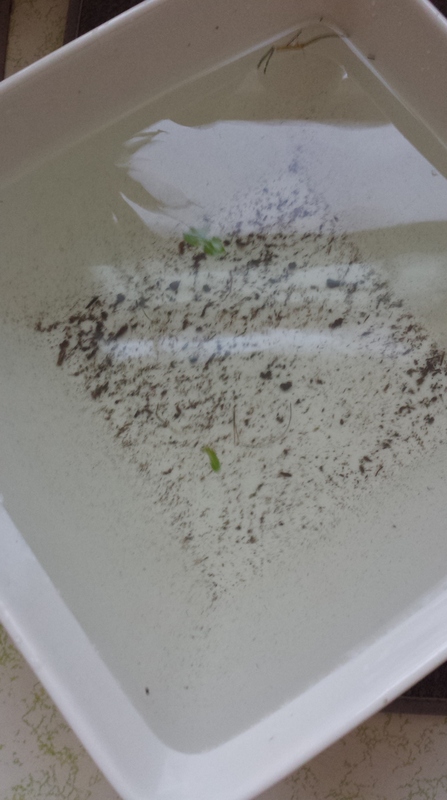 Lift out the greens and give them another quick rinse in a colander, then let them dry or pat them dry. These pecans. Oh, these pecans are really good. They’re adapted slightly from a recipe my mom found in a magazine years ago. She makes a big batch for our holiday snacking every year, and every year a guest or visiting family member asks for the recipe. They’re coated with butter and whole unrefined cane sugar, fresh rosemary and thyme, and a dusting of cayenne powder (among other things) and toasted to perfection. I’ve included the recipe, with my adaptations of soaking and natural sweetening, at the end. For reference, I used a little over half a cup, chopped, and included the sweet and spicy residue from the bottom of the container. I’m a sucker for eating the dregs out of the bottom of a container. Mmm. In a bowl, toss the dry greens with a drizzle of California extra virgin olive oil, or EVOO of your choice. Why would I purchase Californian olive oil, when the artisan stuff from Italy is available? Well, it turns out most Italian olive oil is not the real deal. Due to mobbed-up shenanigans in Italy, most of what’s sold as Italian extra virgin olive oil is, at the very least, cut with cheaper oils. Click here to read a fascinating article on the issue by Kristen Michaelis of Food Renegade, one of my favorite blogs. According to many, she never publishes anything without it being researched from a dozen different angles, and I trust her sourcing. The EVOO I buy from a smallish farm in California is fabulously flavorful, and I like it better for everyday use than many Italian varietals I’ve tried. 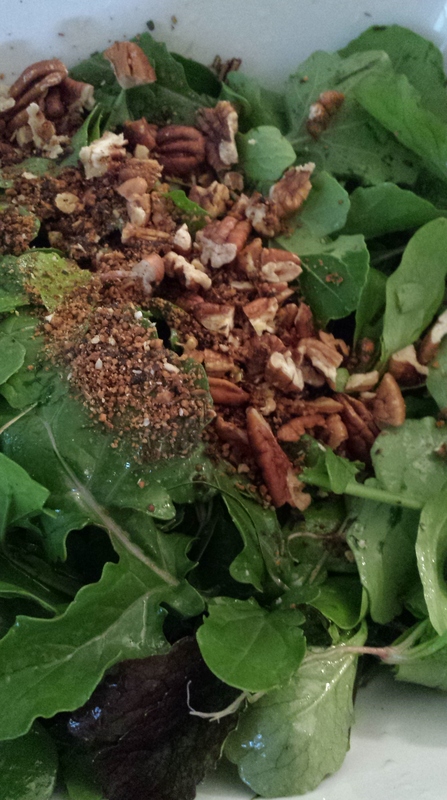 After tossing the greens in the oil, add the chopped pecans and residue and mix them around; the oil helps the nuts and accessories adhere to the leaves. While assembling the salad, dice three strips of nitrate-free bacon from a pastured hog and brown them in a skillet, quick-like. Pigs, similarly to humans, take in a crazy amount of Vitamin D through their skin, so the fat from pigs that have had a happy life out in a pasture is one of the best sources of Vitamin D humans can get their hands on. That stuff fights depression and anxiety and migraines and, and, and… do your own homework. Vitamin D is good stuff. So anyway – drain and mix in those bacon crumbles, then drizzle and mix in a small amount of quality, fruit-infused balsamic vinegar. You can always tell the good balsamic vinegar by how slowly it drips. Quality, unadulterated balsamic is thick and syrupy, and usually nearly as sweet as it is tart. 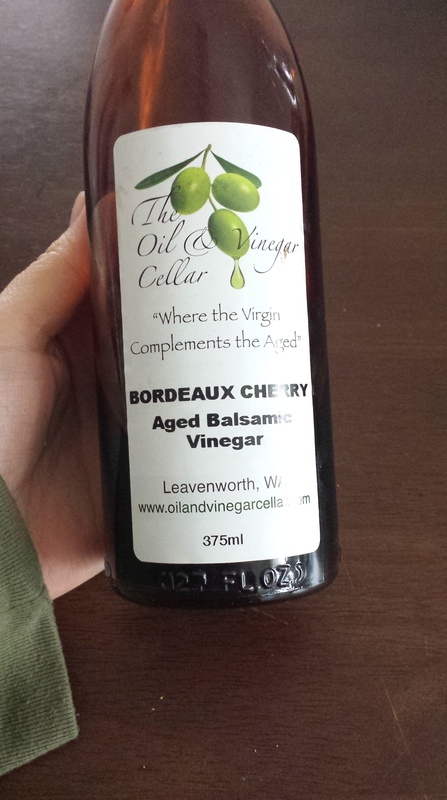 This bottle of Bordeaux cherry balsamic was a gift from my parents, who visited an oil and vinegar shop in Leavenworth, Washington, from which they also brought us some kickass truffle salt. Between the pecans and the vinegar, this meal was practically halfway brought to you by my parents. Thanks, guys! 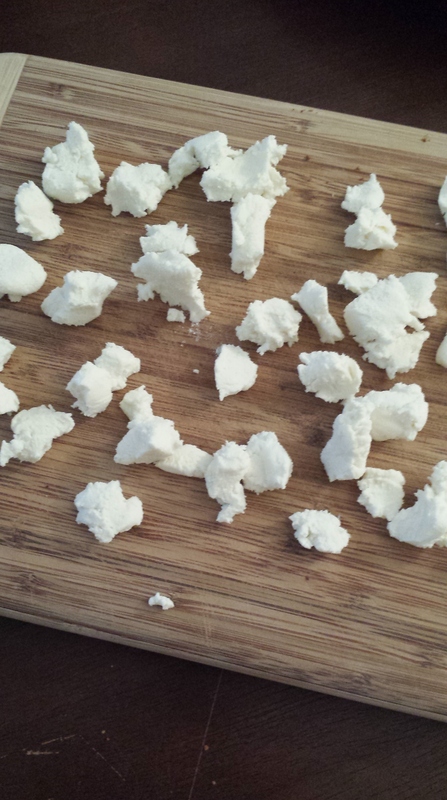 Here, chunked up, is about 3/4 C. of chevre. Goat cheese is the BOMB. Some don’t prefer that “goaty” taste it has, but I can’t get enough of it. Now, I’m not trying to ruin your day here, what with all the “your olive oil is fake” business, but here’s another thing: the goat cheese industry is disgusting. It makes me sad, so I won’t go into it, but I will give you a link to this article by Penelope Trunk, who’s quite the interesting businesswoman and has saved at least a couple of baby boy goats from the blunt force trauma and death they were due for, simply because they couldn’t produce milk. Obviously, that fact is a reality of dairy farm life and it’s much more complex than a set of ideals on either side could succinctly summarize, but I strongly believe in at least knowing where your food comes from. Since I can’t stomach the way animals are treated in industrialized dairy, I opt to get my cheese from local farms, where I can ask the farmers directly about how their animals are treated. I’m not perfect in this regard; I eat at restaurants and the homes of others without being “that girl,” and I’m comfortable with it. Striving for perfection only begats stress, and stress begats health trouble, and I’ve already been down that road, and never want to go back. Glad we made it back safely from that digression. 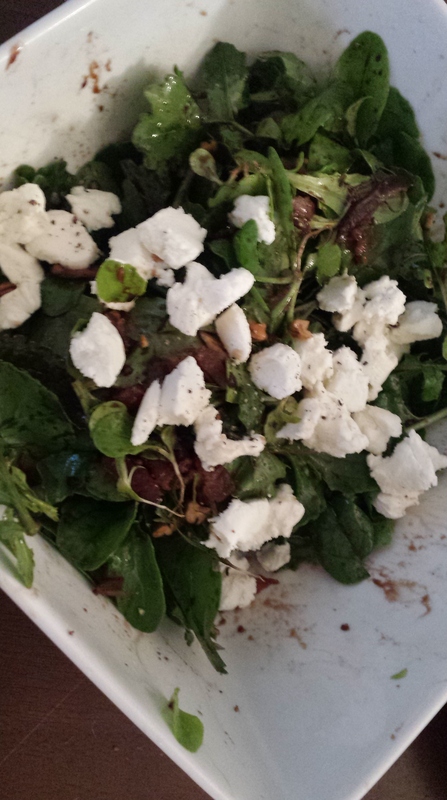 Throw the goat cheese chunks on the salad, grind a couple of grinds of black pepper on top, and savor every bite. This salad fed two people nicely for a light dinner, and would be a good side salad for four. 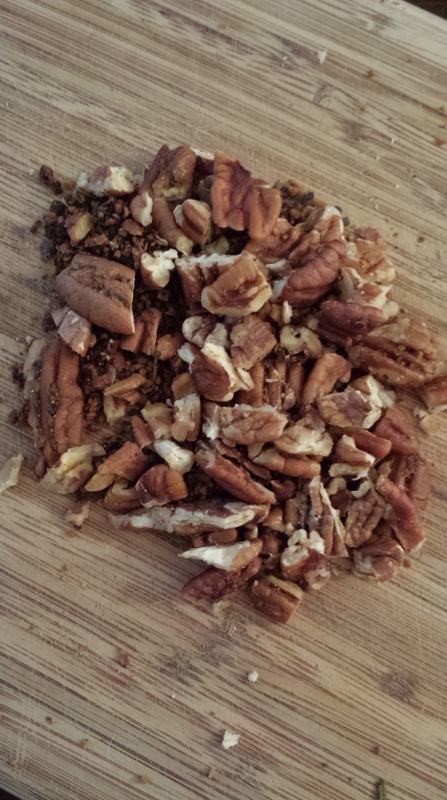 At least a day in advance: soak the pecans in a solution of filtered water to cover the nuts and a tablespoon of salt. This makes the nuts more digestible and brings out their flavor. Dehydrate them using a dehydrator, or by drying them in a single layer in your oven, on the lowest setting, until completely dry (about twelve hours in my oven). Preheat your oven to 400. Mix together all the ingredients, making sure the nuts are evenly coated with butter and the other good stuff. Spread them out in a single layer on a parchment-paper-covered baking sheet and toast them for about eight minutes. Let them cool. Eat them with Brie, eat them in the salad recipe above, eat them by themselves or in a car or in a tree. I don’t care, just eat them. They’re good. 19 Apr	This entry was published on April 19, 2014 at 7:47 pm and is filed under Collection. Bookmark the permalink. Follow any comments here with the RSS feed for this post. Such resourcefulness harvesting those greens! Clever editorial, too – a great writing style. Thanks, Malerie! I so enjoyed this! My mouth watered while I enjoyed your article…I’m almost inspired to visit a farm or something! :). Seriously, though, I’m in awe of your knowledge and passion! Keep this stuff coming!